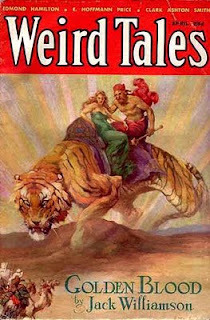 Two of the traits for which Clark Ashton Smith's weird tales are most well-known are their black humor and luxuriant language. Both are nearly absent from his April 1933 story, "The Ice-Demon." Set in prehistoric Hyperborea, "The Ice-Demon" concerns Quanga the huntsman and his two companions, Hoom Feethos and Eibur Tsanth, are they "crossed the borders of a region into which men went but seldom -- and wherefrom they returned even more rarely." The frigid region north of the city of Iqqua was their goal but the object of their quest was, as is so often the case in tales such as this, wealth beyond imagining. Their object was nothing less than the retrieval of the rubies of King Haalor, who, with the wizard Ommum-Vog and many full-caparisoned soldiers, had gone out five decades before to make war upon the polar ice. From this fantastic expedition, neither Haalor nor Ommum-Vog had come back; and the sorry, ragged remnant of their men-at-arms, returning to Iqqua, after two moons, had told a dire tale. One must remember that the civilization of Hyperborea is dying, its cities and settlements slowly being swallowed up by "the great glacier of Polarion" and it was this glacier against which King Haalor and his wizard battled vainly. After their failure, acquiescence to the inevitable became the rule in Hyperborea. But the kings that ruled in Iqqua after Haalor went not forth to do battle with the ice; and no wizard rose to make war upon it with conjured suns. Men fled before the everadvancing glaciations; and strange legends were told of how people had been overtaken or cut off in lonely valleys by sudden, diabolic shiftings of the ice, as if it had stretched out a living hand. And legends there were, of awful crevasses that yawned abruptly and closed like monstrous mouths upon them that dared the frozen waste; of winds like the breath of boreal demons, that blasted men's flesh with instant, utter cold and turned them into statues hard as granite. Rather than fighting their fate, future generations of Hyperboreans plunged themselves into debaucheries and foolish quests for wealth. The latter is the purpose of Quanga and his companions, who are willing to brave the cursed, frozen north in order to obtain the rubies of Haalor, whose location the huntsman believed he knew thanks to his older brother, Iluac, who'd previously found their resting place before fleeing the place out of "a curious eery fear" that suddenly overtook him. But he told Quanga of what he had seen and, because "his was a heart that lusted after gain," vowed that he would not be frightened off as his brother had been. After some weeks of travel, Quanga, Feethos, and Tsanth enter the area of the glacier where Iluac said the rubies could be found. The scene before them was like some frozen world of the outer void. Vast, unbroken, save for a few scattered mounds and ridges, the plain extended to the white horizon and its armored peaks. Nothing seemed to live or move on the awful, glistening vistas, whose nearer levels were swept clean of snow. The sun appeared to grow pale and chill, and to recede behind the adventurers; and a wind blew upon them from the ice, like a breath from abysses beyond the pole. Apart from the boreal desolation and drearness, however, there was nothing to dismay Quanga or his companions. None of them was superstitious, and they deemed that the old tales were idle myths, were no more than fear-born delusions. Quanga smiled commiseratively at the thought of his brother Iluac, who had been so oddly frightened and had fancied such extraordinary things after the finding of Haalor. It was a singular weakness in Iluac, the rash and almost foolhardy hunter who had feared neither man nor beast. As to the trapping of Haalor and Ommum-Vog and their army in the glacier, it was plain that they had allowed themselves to be overtaken by the winter storms; and the few survivors, mentally unhinged by their hardships, had told a wild story. Ice — even though it had conquered half of a continent — was merely ice, and its workings conformed invariably to certain natural laws. Iluac had said that the ice-sheet was a great demon, cruel, greedy, and loth to give up that which it had taken. But such beliefs were crude and primitive superstitions, not to be entertained by enlightened minds of the Pieistocene age. I noted earlier that "The Ice-Demon" that black humor was "nearly absent" in this story, but, as you can see from this passage, it's still present, albeit in muted form. Smith's wry reference to the "enlightened minds of the Pleistocene age" packs as much punch now as it did in 1933, probably even moreso. This being a CAS tale, it's more or less a given that the protagonists will come to a bad end, but I won't say any more here about what happens to Quanga and his greedy compatriots when they eventually discover the last resting place of King Haalor, the wizard Ommum-Vog, and the treasure of jewels reputed to lie with them in their icy tomb, as that would ruin an enjoyable story. I'll say only that "The Ice-Demon" is a Smith story for those who find the author's rich prose a distraction. This is a very straightforward tale, both in terms of its plot and its presentation. Yet, it's still clearly a Smithian product. Doom hangs over the story nearly from the start and, though its meditations upon man's capacity for self-destruction even in the face of greater calamity are more muted, they are nevertheless present and effective. Consequently, if CAS doesn't normally speak to you, "The Ice-Demon" might offer a good opportunity to give him a second look. 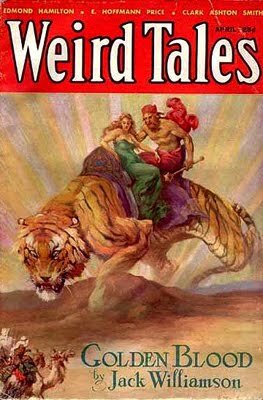 It's not, in my opinion, one of Smith's strongest stories, but it's still an interesting story well-told that conforms more closely to the conventions of "standard" pulp fantasies than do his other tales. Yes, in the Night Shade Books' _Collected Fantasies of Clark Ashton Smith_, this tale can be found in _Volume 4: The Maze of the Enchanter_. Like many of Smith's tales, this one speaks of the human condition, and thank you for prompting me to crack open a book and relive more of its passages. The subtle humor of Smith's works is something I can tell you appreciate, and in his Hyperborea tales, it is more evident. Hmmm... I may want to read this, since Smith's usual style is (to me) all too often florid and painful. A more straightforward tale would be refreshing. Kudos for highlighting an excellent Smith tale. His take on Sword and Sorcery is marvelous, and his prose is only nearly-matched by Vance. This is the first CAS tale I ever read. It mildly interested me. I remember thinking that Smith had more of a message than Howard, whom I couldn't help comparing him to. The best Smith tale I ever read was "The Double Shadow," though "The Testament of Athammaus" was good too. I've read a bit of his Hyperborea and Poseidonis tales but nothing of Zothique or . . . that one that Castle Amber was written for. Can't remember the name right now. I'd be interested in finding out which of his tales people on this blog like best.